We are not an island unto ourselves, other people are involved in our lives, and therefore our child’s life. We can’t control those friends and families words, but we do need to be aware of them. When a child comes from trauma, they have a heightened awareness of the world around them. 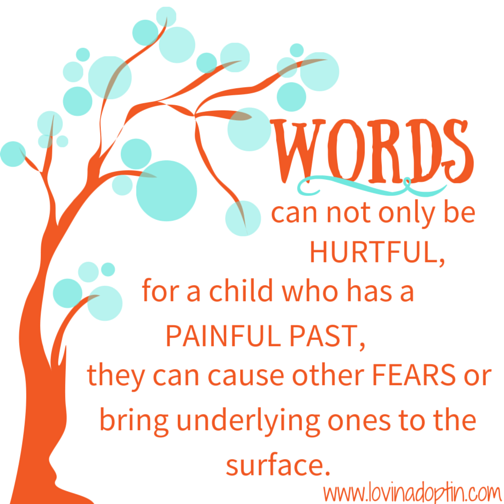 Words can not only be hurtful, for a child who has a painful past and is always on alert, they can cause other fears or bring underlying ones to the surface. For years we struggled with what family members said around our adopted children, it was as if some of them had no filter (well, truthfully, they don’t). 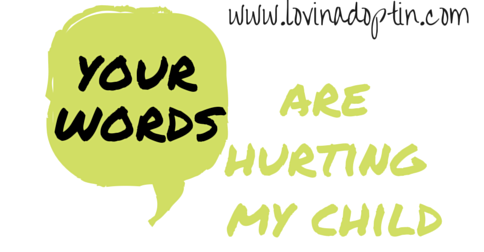 I’m sure many of you can relate, whether it’s family, friends, or acquaintances you run into consistently, some people simply aren’t aware of what their words do to our kids or us. Our daughter, Payton, used to worry a lot. For two-and-a-half years, one of the many things she obsessed over was our cat that passed away. We believe in heaven, so we told her he’s there and that Jesus is taking good care of him (let’s not get into theology here okay:)), but that didn’t ease her worries. Certain people in our extended family didn’t recognize her fears, her fears that reach far beyond her cat passing away. They used words, such as “dead,” and “killed” flippantly while relaying stories, or even directly towards her, warning her of something dangerous that could happen. While Payton was in close proximity, one family member told a story, saying, “…when a child is dying of a disease.” We didn’t need Payton worrying about something else! Children dying? What’s a disease? Will I die of a disease? Children hear everything. You would be surprised, and probably have been on many occasions, by what they’ve repeated to you, when you thought they were busy somewhere else, engaged in an activity while you talked. Because of where our children come from, they worry, and we have to be careful about the words we, and others, use around them. Others in your child’s life might believe that a child has to learn about the world sometime. They might say things like, “It’s life.” This is not okay, especially if a child has a predisposition to fear and concern in their everyday life. Frankly, my child has lived a “life” far more embedded in reality than most anyone who says this. Be thoughtful in your approach (although this statement kinda makes me want to yell), and help guide others in how to speak to your children. I didn’t mind many of these questions and comments when my kids were younger, because they didn’t understand. I was also naive many times and thought if I talked quietly my children couldn’t hear. Wrong. Most often those asking aren’t being rude or offensive on purpose, they’re curious and the more education I can bring to our world, the better it will be. “Are they siblings?” I’ve been asked this a few times. If we say, “No,” then our children will look at us like we just mentioned the Brady Bunch. If we say, “Yes,” and one child is Asian and the other is Caucasian, well, it can get awkward. My response to this is, “They are now. They aren’t biological siblings though.” I’ve watched as a light dawns in the persons eyes. Hmmm, yeah. “What’s their story?” Same as above. People really don’t realize what an impact saying,”I couldn’t do what you’re doing,” has on our kids. It didn’t really dawn on me for quite a while. They’re essentially saying that what we do is hard, and what we “do” is our kids. Do you get that? It comes across to our kids as, “I couldn’t take care of those kids and do what you’ve done, because that looks damn hard.” Yikes! Okay, let’s put it this way. What would it be like if someone said to your spouse (while giving a sideways glance at you), “I couldn’t do what you do everyday!” Oy, that hurt. “How much did they cost?” Again, up to you and how much personal information you want to share. You may not want to comment around your children though. *I titled this post in this way so you could share it with others. Be sure to check out my previous post, Our Words and How They Affect Our Kids, as well as the CONTENTS page for more posts on autism, adoption, and foster care. This entry was posted in adoption, foster care and tagged how words hurt adopted children, what people say to adoptive parents, what people say to foster children, what people say to foster parents, what people say to my adopted child, words cause fear in adopted and foster children. Bookmark the permalink. Wonderful! I have a family member just like that. Tracy, thanks for these gems, they have helped me start thinking hard about my own responses to these questions. Thank you for sharing your actual replies, I think handling these sometimes invasive questions requires developing a script when you have time to craft a thoughtful, meaningful reply and not just let a a knee-jerk, often defensive response fly out of your mouth! I’m so glad they’re helpful. Some interesting thoughts here that I hadn’t considered.